A class 2 deviation is retained by means of 2 DRs which hinge dorsally in the synthetic resin grooves of the lower plate. 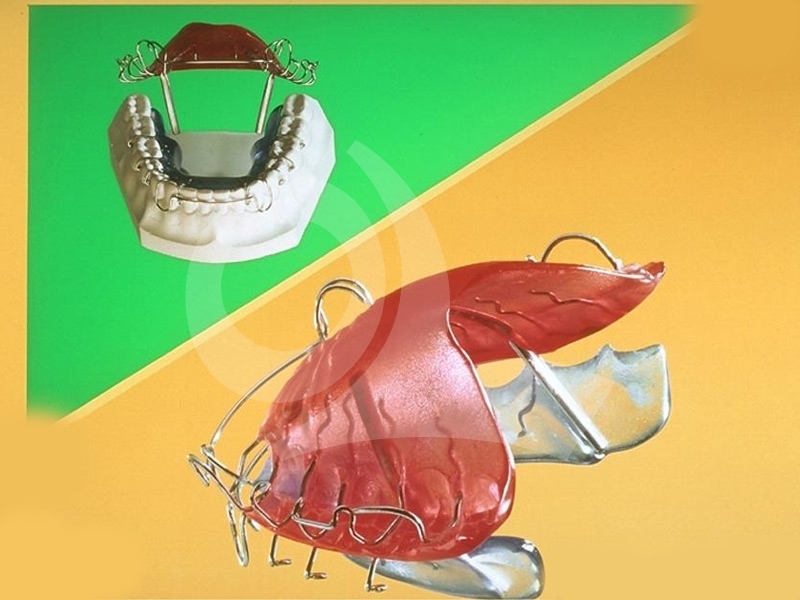 The corrected irregular front stand is retained by means of a 0.5 mm bumper spring: this has a similar action to that of a spring or bonded retainer except for the fact that fine (over)-corrections of the front teeth are still possible. The disadvantages of bonded retainers (including the shifting of teeth if the bonded retainer breaks or becomes loose) are avoided if DRs are used. If DRs are worn continuously, they also have an Activator action: the appliance can be activated in the ventral direction (stepwise, Jumping de Bite). DRs are more comfortable to wear during the day than positioners. The DR cannot be fitted in patients with very small jaws, as it causes excessive obstruction of the tongue. wo long supports (as far as the tooth papilla) are fitted between 3/2 and 2/3 for vertical retention at the front. A bumper spring of 0.5 mm (gn 0.6 mm) for the incisors. he synthetic resin does not touch the incisors (keep a space of 1 mm in between): in 98% of cases, the bumperveer has to be adjusted so that it fits closely, even though the spring was made correctly on the model. Curved between M1 and M2 along the condyle and fitting into the grooves in the lower plate. 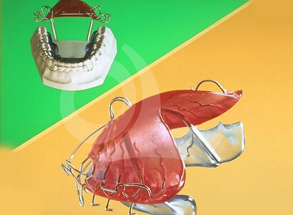 The Müller Sporne may not project beyond the lower plate or pressure ulcers will form on the tongue.